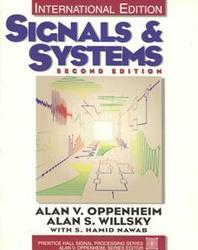 This comprehensive exploration of signals and systems develops continuous-time and discrete-time concepts/methods in parallel -- highlighting the similarities and differences -- and features introductory treatments of the applications of these basic methods in such areas as filtering, communication, sampling, discrete-time processing of continuous-time signals, and feedback. Relatively self-contained, the text assumes no prior experience with system analysis, convolution, Fourier analysis, or Laplace and z-transforms. Develops continuous-time and discrete-time concepts in parallel -- highlighting the similarities and differences. Introduces some of the important uses of the basic methods that are developed -- e.g., filtering, communication, sampling, discrete-time processing of continuous-time signals, and feedback. < b>contains MATLAB-based computer exercises for each topic in the text. Material on Fourier analysis has been reorganized significantly to provide an easier path for the student to master and appreciate the importance of this topic. Now represented in four chapters, each of which is far more streamlined and focused, introducing a smaller and more cohesive set of topics. This will greatly enhance the students ability to organize their understanding of the material. Frequency-domain filtering is introduced very early in the development to provide a central and concrete illustration of why this topic is important and to provide some intuition with a minimal amount of mathematical preliminaries. The students will be able to see why this topic is so important and gain some intuition which will enhance his or her appreciation of the developments that follow. Much of the advanced material that had appeared in the Fourier transform chapters in the first edition have now been pulled together into the time and frequency domain chapter, so that only the basic concepts are introduced in these chapters; and provide a more cohesive treatment of time and frequency domain issues. Relocates coverage of Sampling before Communication. Includes significantly more worked examples. Provides over 600 chapter-end problems, -- 20 per chapter, with answers (not solutions). Features a majority of new chapter-end problems. <>have been reorganized and assembled to aid the student and instructor. They provide a better balance between exercises developing basic skills and understanding ones that pursue more advanced problem-solving skills. New edition organizes chapter-end problems into four types of sections which makes it easier for the instructor and student to locate the problems that will best serve their purposes; and provides two types of basic problems, ones with answers (but not solutions); and ones with solutions to provide immediate feedback to the student while attempting to master the material. 3. Fourier Series Representation of Periodic Signals. 4. The Continuous-Time Fourier Transform. 5. The Discrete-Time Fourier Transform. 6. Time- and Frequency Characterization of Signals and Systems.